I used to take the bus to attend Dodgers games when I was young. Me and my buddies would pay $1.25 for general admission tickets ... then spend a few innings trying to sneak down one of the stairwells to get to the lower levels of the stadium. My three favorite Dodger players at the time were Bill Buckner, Willie Davis and Claude Osteen. As such, I was very sad to learn that Willie Davis, the best center fielder in Dodgers' history, died this week at the age of 69. Authorities said a neighbor, who usually brought breakfast to Davis at his home, discovered his body. The case is being handled by the Los Angeles County coroner’s office, but authorities said it appears that Davis died of natural causes. William Henry Davis was born April 15, 1940, in Mineral Springs, Ark. He was a star athlete in baseball, basketball and track at Roosevelt High School in Los Angeles in the late 1950s, and signed with the Dodgers in 1958. He spent only two seasons in the minor leagues before joining the Dodgers briefly in 1960. "He was so talented," former Dodger shortstop Maury Wills said in an interview Tuesday with the Los Angeles Times. "God really blessed him with some great tools — for any sport, really — speed, strength, agility — everything an athlete needs in order to make the big time." 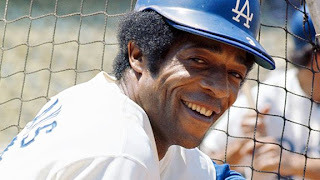 Davis, known as "3-Dog" for his uniform number and his speed on the bases, was a key member of outstanding Dodger teams during the 1960s that won World Series titles in 1963 and 1965 and the National League pennant in 1966. He batted .305 or higher for three consecutive seasons beginning in 1969. And he still has more hits, extra-base hits, triples, runs scored, at-bats and total bases than any Dodger during their years in Los Angeles starting in 1958. "The thing about Willie Davis that left the greatest impression on you was the sight of him running," said Dodger coach and former teammate Manny Mota. "Once in spring training, I saw him score from second base on a fly ball to center field. He was the only person I ever saw do that." Davis hit .279 over his career, with 398 stolen bases, including a career-high 42 in 1964. Willie Davis was one of my childhood sports heroes. Who was your favorite baseball player back in the day? Oh man! How did I miss this news? What a sad thing to come across. Thanks for the wonderful tribute. We sports fans will always miss our heroes. I wasn't familiar with Willie Davis but Claude Osteen was one of our coaches for the Cardinals when I was a kid in St. Louis. Never knew he was a former player himself. Great tribute about Davis as Travis said. Glad he gave you and your buddies so many great memories. RIP Big 3. Should have said RIP 3-Dog. And to answer your last question, Ozzie Smith, the Wizard, was my favorite. Prior to that it was Lou Brock, especially when he broke your Maury Wills' single season stolen base record (smile). Travis - Glad we could be a source of information for you. Who was your favorite baseball player back in the day? Martin - I understand that Claude Osteen first came into the majors with St. Louis. And I do remember feeling bad for Maury Wills when Lou Brock obliterated his stolen base record!